My Gun Culture: So Michelle, from a look at your background, I see that you’ve served in the Army Military Police and Border Patrol. Can you give us a bit more background on that? Michelle Viscusi: I’ve actually served in the Army National Guard. My time with Border Patrol was during my active duty with the Army. I was assigned to border patrol duties for about a year and a half. So I was still Army, just working with my counterparts at Border Patrol. MGC: So you were busting people coming across the border and engaging in big firefights with drug cartels? MGC: So you were piloting attack drones then? Michelle: No, unfortunately we didn’t get to do any cool things like that. I wish! MGC: We just talked with KC Eusebio, who is also retired Army. Since you were part of the Army Military Police, I suspect you had some run ins with him. How many times did you have to arrest KC at some Tijuana bar for conduct unbecoming of an Army soldier? We expect the truth, so no trying to cover for your teammate! MGC: Well, just make one up! Michelle: He doesn’t even drink, so there’s no way I could have arrested him at a Mexican bar. MGC: Maybe he just likes to fight in bars? Michelle: Are you calling me fat? MGC: No, I’m calling ME fat. What do you do as an MP? Are you out arresting people and throwing them in the brig? Michelle: Well, actually I’m not LEO (law enforcement officer), I’m more general purpose duty. MGC: Let’s talk about Top Shot! We’re big fans and loved your season. What changed in your life the day after the first episode aired? Michelle: My life has completely changed! The show helped me to get here! It’s interesting because my time in the military helped me get on Top Shot, and Top Shot helped get me into competition shooting representing Glock. Obviously I wasn’t on there a really long time, but I’m thankful to have a good following! MGC: How did you decide to apply for the show? Michelle: I was watching Season 2 and loved it. I sent in an email and photo and I heard back about 3 weeks later. From that point, it was just following the application process. MGC: So did you shoot Glocks before joining Team Glock? Michelle: Well, actually, the first gun I ever owned was a Glock 19, so I’ve always been crazy about Glocks. MGC: How old were you when you got your first Glock? Michelle: Ummm….. 21? Yeah, it must have been 21… But seriously I started shooting my own Glock 19 when I was 19. But I started shooting when I was 15. When I started shooting competition, I started shooting a Glock 34. MGC: Tell us about the first time you ever shot a gun. Michelle: Well I was 15 and my dad took me to the range, just for fun! I was nervous but loved it. My dad was a cop, so he had a gun and shot quite a bit. MGC: Were you instantly hooked or was shooting just something you did now and then? Michelle: Well actually at the time, I was really big into gymnastics – that was what I was going to do. But when I joined the Army, I really grew to love shooting – so that’s when I got really serious about it. MGC: Tell us how many Glocks you own. You can round off to the nearest dozen. Michelle: We’ll right now, I only own two. But I expect that to be changing this year when I start competing more. MGC: How much time do you expect to be on the road competing this year? Michelle: It’s averaging 1-2 weeks per month. My schedule seems to be about 2 competitions per month, but I am shooting and preparing for a week around each one. MGC: Tell us about the equipment you’ll be using this year. Michelle: I’ll mostly be shooting a Glock 34, but will use a Glock 17 for some divisions. I’m doing both IPSC and IDPA. I use a JR Holster. MGC: So what’s it like jetting around the world in the Glock corporate jet? MGC: We ask everybody to weigh in and solve a long standing debate question. Do you think that an MK19 Automatic Grenade Launcher is appropriate for home defense? Michelle: We’ll only if it had a Glock Gen 5 logo on the side. And I would put one in each window, facing out, to minimize blast damage in the house. MGC: Let’s finish up with a hypothetical question. The Gunny, R. Lee Ermey, also represents Glock. If you had to bust him for disorderly conduct, could you take him down alone, or would you have to call for backup? Michelle: You know, I’d probably have to call for backup, but I’d give him a good fight! 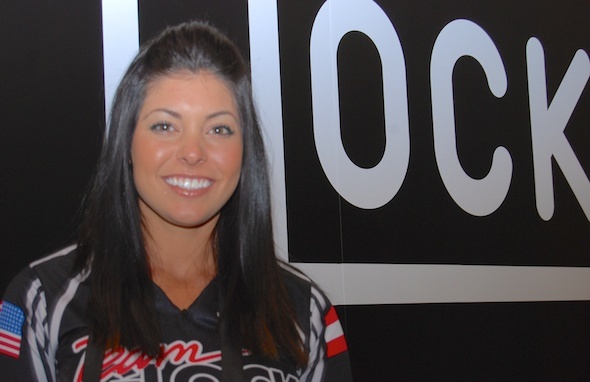 Thanks to Michelle Viscusi and the nice folks from Glock for helping us catch up and learn a little more about Glock’s newest competitive shooter! – Aw, Chels! You look SO absolutely gooregus! (No surprise there.) Congratulations!!! And all the best to you and Jesse in your new life on the coast!Lisa: Fab job, as usual! Beautiful!